The announcement confirms earlier leaks about this new ultra-thin laptop, which Lenovo says is the "thinnest and highest performance combination for its class." 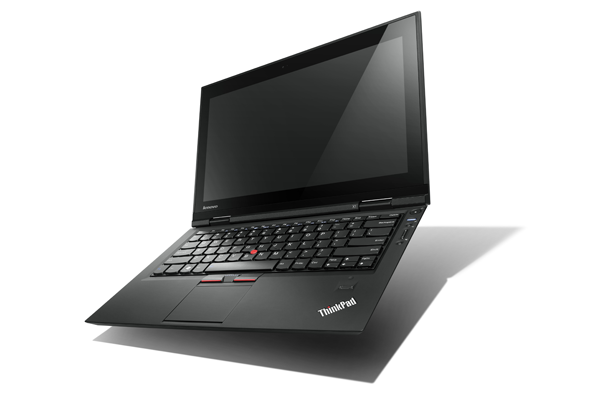 The ThinkPad X1 keeps the classic ThinkPad "black box" appearance yet is 0.67 inches at its thinnest (about the height of a penny)-similar to the MacBook Air's 0.68 inch measurement. The X1 also has a very pleasing rubber texture over the sturdy magnesium chassis and weighs about 3.7 pounds. Other consumer influences can be seen in the ThinkPad X1's HD audio, HDMI port, Intel WiDi, and super-bright display. Although the 13-inch display looked great even from side viewing angles, I do wish the screen was matte rather than glossy. Built with Corning Gorilla Glass, however, it is a very durable and scratch-resistant screen. Yes, the Lenovo folks ran some keys across the screen to prove it. As we recently saw on the ThinkPad T420s, the X1 also has the Rapid Boost capability for starting up and shutting down faster, as well as RapidCharge technology that charges the battery up to 80 percent in 30 minutes. The battery should last about 5 hours, but you can double that with an external slice battery. The best thing about the ThinkPad X1 official specs? It doesn't cost $2,919, like we saw posted on a Swiss site. Pricing starts at $1,399 and you can order the laptop from Lenovo and other retailers starting May 17. The ThinkPad X1 has now risen to the top of the top Windows alternatives to MacBook Air list, for me at least. If you like to mix business with pleasure, you may feel the same way.